Geka has been manufacturing ironworkers since 1919. Thanks to their years of experience, Geka ironworkers have become an industry standard and are known for their durability, precision and operator-friendly features. 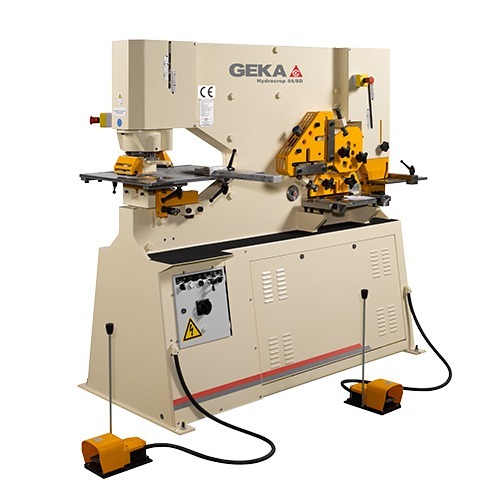 Today, Geka manufactures a full line of equipment in a variety of sizes, ranging from simple manual ironworkers to the latest CNC automated machines. Read on to learn about the qualities that make Geka a leading brand. With over 90 years manufacturing ironworkers, they were pioneers developing ironworkers and yet continue adapting and improving them to meet the market and their clients’ needs. They machine all of their parts and tooling at their own factory, without outsourcing. This ensures quality standards that are much higher than others offered in the market. Their CNC solutions for automatic processing of profiles combines years of experience in punching and shearing with the sate of the art electronics in order to offer to the market advanced machines with an excellent price quality balance. Their technical department can design and provide almost any accessory so that your GEKA machine can accomplish a variety of jobs. They constantly research, develop new products and technology and innovate so that they can exceed your expectations. If you’re interested in learning more about Geka, contact us today to request a quote. We look forward to helping you specify the best Geka ironworker for your unique application.